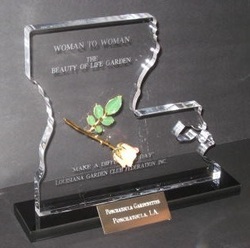 Beauty of Life Garden - Louisiana Garden Club Federation, Inc.
A freestanding, Louisiana shaped, traveling plaque will be awarded annually to a Louisiana Federated State Garden Club for the most out-standing, permanent, pink rose-garden. The garden must be planted in a public place in the community during the month of October in support of Breast Cancer Awareness. The garden is to be planted to create awareness of breast cancer in both men and women; or in recognition/dedication to breast cancer survivors; or in memory of breast cancer victims, both men and women. A certificate will be presented to each applicant.